I love this book. My brother actually read the passage about becoming Real at my wedding. 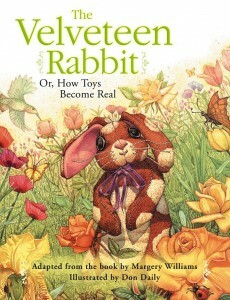 So with the holidays around the corner and the pace slowing down for a while in the library, I read Don Daily’s illustrated version of Margery Williams’s The Velveteen Rabbit with all the first grade classes this month. I wasn’t sure how they would respond because this book is so outside of their experience (I remember my principal telling me I need to explain what things like tea parties are because our kids don’t know). But the kids loved it. Even with the old fashioned language and frequent stops to explain words they didn’t know and why the toys had to be destroyed when the boy got sick, they completely understood the heart of the story. They were so empathetic to the little rabbit and his feelings, and we talked a lot about the toys we have that are Real to us. And they adored the illustrations in this version. It took about 2 class periods to read it to the kids, but they couldn’t wait to finish it.